If there's one thing that endeared Korean boy band CNBLUE more to their fans during their "Blue Moon: 2013 CNBLUE World Tour" in Manila concert on June 15, it was their effort to connect to the audience by speaking in Filipino and English. From "Masaya ba kayo? (Are you happy? )," "Sabay-sabay (All together now)," "Kantahin (kantahan) natin siya (Let's sing for him (Yonghwa))," "Nagugutom na ako (I'm hungry)" to "I love you Philippines," "Make some noise," CNBLUE made sure that the fans who went to the concert at Araneta Coliseum would have fun and could relate to what they were saying. CNBLUE's Yonghwa, Jonghyun, Minhyuk and Jungshin brought the house down when they performed for more than two hours before thousands of fans in the coliseum. The pop group opened the concert with the English song "Where You Are" followed by "Get Away," "One Time," "Man Like Me" and "Coffee Shop." Other songs they performed included "I'm Sorry," I'm A Loner," "Love Light," "La La La," "Love Girl," "You've Fallen for Me," "Feeling" and "These Days." "Magandang gabi Manila. Kami ang CNBLUE (Good evening, Manila. 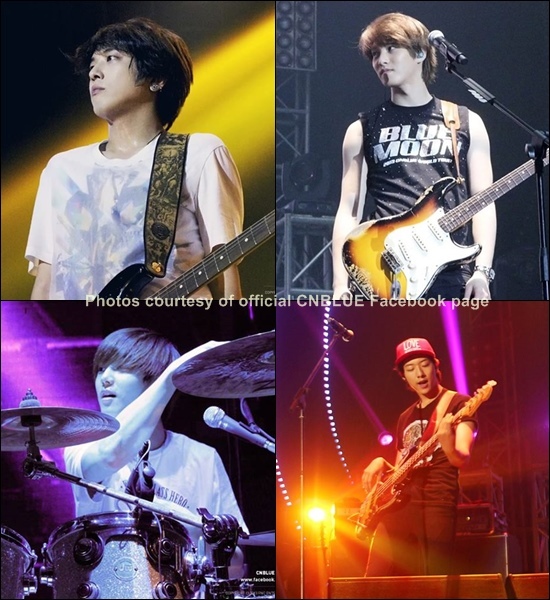 We are CNBLUE)," the band greeted the audience and also introduced themselves in Filipino. With CNBLUE being a pop rock band, there was no dancing or seamless choreography, which is a key ingredient in K-pop acts. Rather, CNBLUE captivated the audience with pure music and their talent in playing instruments. Leader Yonghwa is the main vocalist. He also plays the guitar along with Jonghyun and Jungshin. Minhyuk is the group's drummer. Fans screamed and shouted, and waved blue lightsticks and banners to show their support for the boys. In between songs, the band members engaged the audience by speaking in Tagalog, English and Korean. In one funny moment during the encore, Yonghwa blurted out "Singapore" instead of "Philippines" as they were performing "You've Fallen for Me." He was clearly embarrassed but the audience cheered him up to say that it was okay. Hours before the concert started at past 8 p.m., long lines of fans were seen outside Araneta Coliseum. Many of them were wearing their "Blue Moon" shirts and CNBLUE headbands. After the concert, Yonghwa tweeted a picture of the group. "Hello, I'm Yonghwa! I love Philippines, I love Philippines, I love Philippines!!!!!!!!!!!!!!! Thank you for the birthday wish. It's an unforgettable night! Here comes a hot cheer! I love Philippines!!! x 100000000000000000000," he posted. Fans told Bulletin Entertainment that they were overwhelmed by CNBLUE's performance. "The concert is worth the wait!!! I've been praying and praying and praying for them to come here and they finally did. I can't believe I finally saw them!!! MINHYUK IS JUST SO HANDSOME & SO COOL!!! It's just one of the most memorable moments in my fangirl life!!!" said 26-year-old Vanessa Dagohoy. Fan Audrey Lu, 20, whose favorite is Yonghwa, said, "Wow. They're the best. These boys really know how to make their fans go crazy! I was kinda shocked, not expecting that some of their songs would be arranged differently. It turned out to be really great! They sing better live too I must say. These boys know their instruments, it's like they breathe with them. You can really see how passionate and devoted they are to their work. I'm just really glad I was able to witness CNBLUE's charm and magic." Sofia Dianne Ortiz, 18, of Bulacan, said, "My bias is Yonghwa. This is my very 1st concert and it was beyond amazing! CNBLUE was perfect and very talented. I love how they tried to converse and speak in Filipino. Over-all, it will be a night I will never ever forget." Bulletin Entertainment interviewed fans at Araneta Coliseum after the concert and asked them what they thought about CNBLUE's performance and their favorite band member. "It was very nice...It was very good actually. It's my first concert ever and it was worth it," said Bless Daban, 27, who described his favorite member Yonghwa as very talented. Her friend, Daisy Combong, 27, from Makati, said, "It's so great," adding that her favorite part was when CNBLUE sang "You've Fallen For Me." She's also a big fan of Yonghwa and Yong-Shin couple (Yonghwa and actressPark Shin-hye) because of the Korean drama "Heartstrings." Angie Rivera and her daughter Kristine Rivera-Cueto from San Pedro, Laguna, also watched the concert. "I enjoyed watching the concert last night. Love the drummer [Minhyuk]. How I wish he sings solo. He seems simple yet he rocks," said Rivera, who's a fan of K-pop and Korean dramas. Karen from Silang, Cavite, a fan of Yong-Seo "couple" (Yonghwa and Girls' Generation's Seohyun), said the concert was "Super sulit. Super ganda. Energetic (It was worth it. Beautiful)." The concert was "the best. Ang sigla nila at ang saya," said Sarah Jane Pilas, 20, from Quezon City, adding that her favorite is Yonghwa because he's handsome. France Obligar, 18, from Pangasinan, said she enjoyed the concert and her favorite song was "Love." She loves all the CNBLUE members. May Pajarillo, 20, of Malabon said she had fun at the concert, adding that her favorite is Yonghwa because "he's so cute." She said her memorable moments were when CNBLUE sang "Love" and "Love Girl." Rhia, 25, from Quezon City, described the concert as "amazing, breathtaking and super." Her favorite is Yonghwa and her favorite part in the concert was "Love Light." "Super love ko siya. Ang ganda ng voice nya. Ang galing nya mag-compose at super gwapo (I love him. His voice is amazing. He's a great composer and very handsome)," she said. CNBLUE promised Filipino fans that they will come back to the Philippines.